Miami Beach coastal resilience: Laguna Vizcaya | DAVE HAMPTON, JR. The Biscayne Bay Region has the potential to effect positive change in transforming aqueous terrain into higher, drier land. Using the tools and language of early Miami Beach development, future urban development can once again rely upon building grounds in water. Fig. 1. Tree island, Everglades. Islands are constructed, whether by ‘natural’ forces, people, or some combination. Hammocks – hummocks, or tree islands – demonstrate two interlocking general characteristics of islands which may be of great importance to Miami Beach, a place driven – and defined – by its relationship to water, and to coasts: 1) their dynamism, and 2) the capacity for fostering increasing density and diversity through the mediation of land and water. We might term this island urbanism. In nature, very little persists in a static state. The propagation of hammocks – as with other robust ecosystems – depends less on the presence of individual species and more on the interplay of forces over varying scales of time. Tree islands change in form and number and/or type of species they support (and of which they are comprised) in response to fluctuations in nutrient levels and the flow, salinity, and quantity of water present. Being situated on Biscayne Bay, the latter becomes especially pertinent. Some high canopy species – such as oaks, red maple, or even highly-valued mahogany – may find fertile higher ground which once was fluid and inhospitable. In cypress swamps, soil tends to be trapped and held around the “knees” over the roots, as it does among the buttressing roots of mangroves – indigenous to Biscayne Bay – where new ground is ‘made’. As botanist Peter del Tredici might say, “plants know what’s up” concerning how species might adapt to a future with more precipitation and greater fluctuations in temperature. Applying this to a changing Biscayne Bay, as we will see, could make things even more interesting. Fig. 2: Shell spoil piles, Calusa tribe, Everglades. Human history abounds with the shaping of aqueous terrain to become land in similar fashion to that of tree islands. Human intervention in the form of prehistoric trash mounds and shell spoil piles has even been thought to extend the reach of tree islands exemplified by the living patterns of indigenous peoples such as the Calusa (southwest Florida) in the Everglades, Tequesta [Fig. 2] (southeast Florida), and Seminole (south Florida). Tree islands form, essentially, a field, an infrastructure for development, much like that of the orthogonal Jeffersonian survey grid. In cities like Boston and Mumbai, this landmaking has extended the reaches of the city, knitting together land and water, extending the grid. Is this the city reaching out into the water? Or, the water claiming land? This island urbanism – the increasing concentration of diversity of life where land and water mingle – happens at scales small, intermediate, and large. Why not use the tools and language of early Miami Beach development as we project forward? Fig. 3.: An island urbanism timeline, or, a biography of an archipelago-in-the-making. Fig. 4: North Biscayne Bay – inputs and flows. We consider the first three – on the site of Biscayne Bay – in order to make the fourth viable again and to avoid the need to resort to the sixth. Coastal rivers and tidal creeks traversing Miami-Dade County have been eliminated or channelized, changing the pattern from distributed sheet flows and gradual inputs to ‘flashier’, intense discharge point sources of freshwater, where salinity drops sharply. Marine conditions are complicated by the new connections to the Atlantic Ocean: Haulover Cut to the north and Government Cut (1920) to the south, introducing ocean mixing and inlet sedimentation [Fig. 4]. Also, the fanciful lozenge-shaped confections of constructed land – or ‘made land’ to borrow Boston historian Nancy Seashole’s term – such as the Venetian Islands, Star Island, and Belle Island cluttered north Biscayne Bay in the 20th century, further altering its ability to flush and recharge as bodies of water normally do. 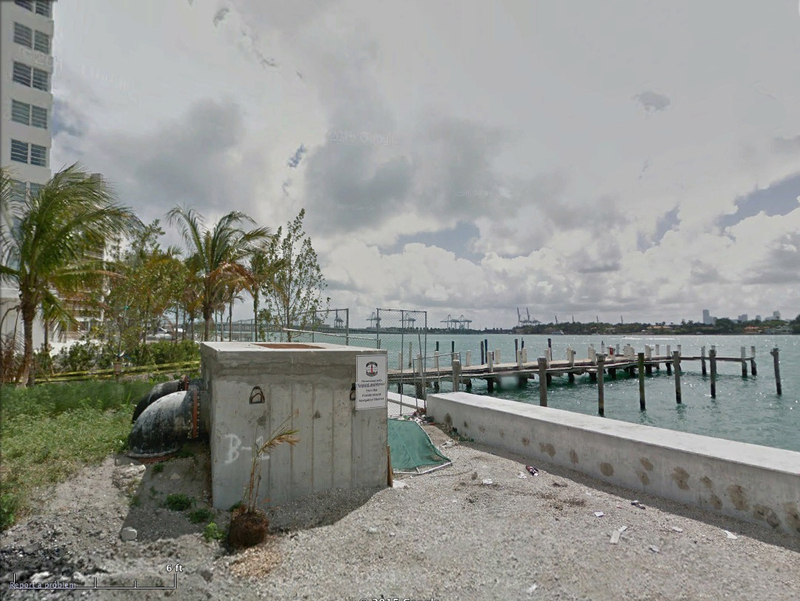 Dodge Island, constructed in 1935 from dredge spoil, location for the Port of Miami, has clearly impacted North Biscayne Bay’s formerly more open access to the sea, further modified by dredging along Government Cut. Fig. 5.: Forces and flows within – and adjoining – Biscayne Bay: grounds for possibility. Despite their 20th century impacts upon the Bay, such an island urbanism has the potential to effect positive change in the Biscayne Bay region. First and foremost – and simply put – there is the possibility of more places to build. Rather than uniformly out-of-scale level of development, or an uncoordinated speculation as seen in the early 20th century which might further negatively impact the Bay, development could be targeted to a mix of greater densification and temporal uses – both vertically and horizontally. Where low-lying land on existing islands is dominated by low-rise private development, a shift to multistory buildings could be encouraged. Where the ground floors of existing buildings will be challenged by rising waters, wet- and dry-floodproofing could explored, with vertical expansion to upper floors to compensate. Second, the Bay as an urbanizable field [Fig. 5] introduces further possibility for reducing vulnerability and increasing robustness. The opportunity for gradients of water – fresh, brackish, saline – across the Bay surface could address the effects of changes in salinity (Patrick: salt) without relying on a regime of pumping and importing freshwater. New rainwater capture/recapture capacity could further extend water security. The impact of hurricanes and the effects of flooding from storm surges and extreme rain events might be lessened by decentralizing urban population centers and redistributing over a more pervious area suited to periodic inundation. In drawing on past ecologies, then, we have identified a potential surface for future operation: the water. Fig. 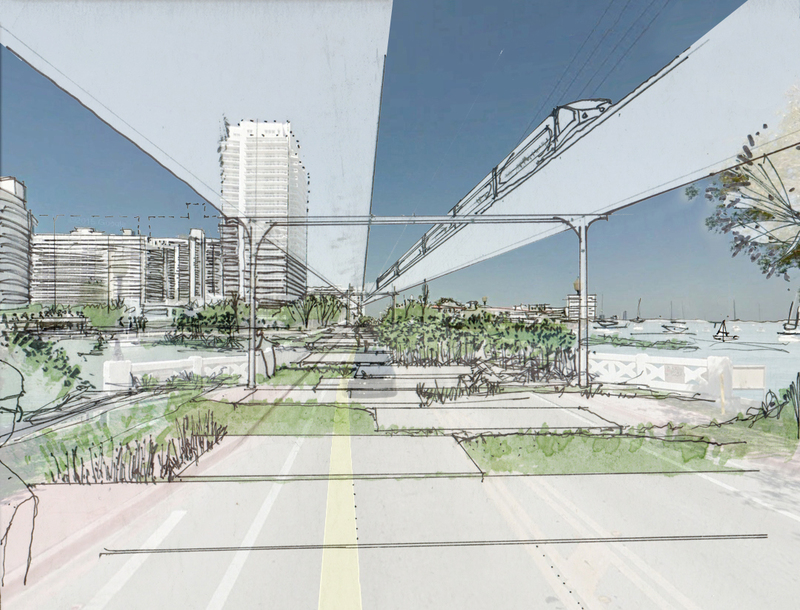 6.: Big Mac: linking public spaces from Miami to Miami Beach along the Macarthur Causeway. The species found on tree islands colonize where the conditions are most favorable, but, to some extent, they also create those conditions. Two further lessons from the tree island playbook might be considered: connect the dots, and find the low-hanging fruit. Modifying some of the existing linkages from/to Miami [Mikaela: causeway ‘vectors’] could introduce new public space while introducing multimodality to evacuation routes, linking to existing public spaces [Figs. 6-9]. Construction along Miami Beach’s west coast and Alton Road tends to already have a higher ground floor. If both the existing causeway and future construction were raised (and/or existing construction retrofitted), extending southeastward to South Pointe Park, a modest-height multipurpose levee would create new linkages around South Beach all the way to Miami, while introducing the possibility of additional flooding control measures – a tidal barrage – for tidal surges during the most acute times. While infiltration through karstic limestone still must be accounted for, and keeping the water out will never be fully viable, requiring pumps in the immediate future, the real objective is to draw people closer to the water – or at the very least, closer to the idea of not needing to keep it out. Because the two bridges connecting the Macarthur Causeway to the mainland already have high clearances (65’ and 45’, respectively), they are good candidates for weathering sea level rise. What if the existing roadbed were retained, and light rail built over top? What if pedestrians and bikers – who currently take their life into their hands – had dedicated widened paths all the way from Lummus Park to Bicentennial Park in Miami? What if a network of floating paths at varying scales – to which anyone who sails, boats, or does most anything on the water is already accustomed – could create not only a more robust balance between traditional evacuation routes and means for sheltering-in-place, but new paths to the water? 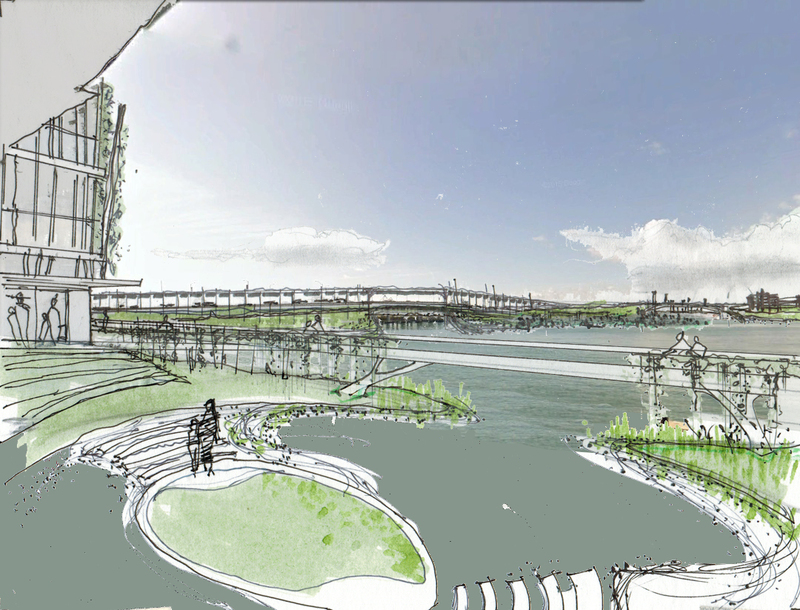 Might this spur other possible uses for the Bay: short-term residential and seasonal tourist accommodation, scientific research in the form of floating research stations and in-situ seabed/lagoon-bed research, and even new industries – fisheries, aquaculture, biomass energy, and algal biofuels? Thus, Big Mac might be seen as the first armature along which a third lesson of tree islands might be deployed, encouraging a more nuanced interaction with the interface of land and sea, and preparing us – as Dilip da Cunha might say – to build (once again) upon the ground of water. Fig. 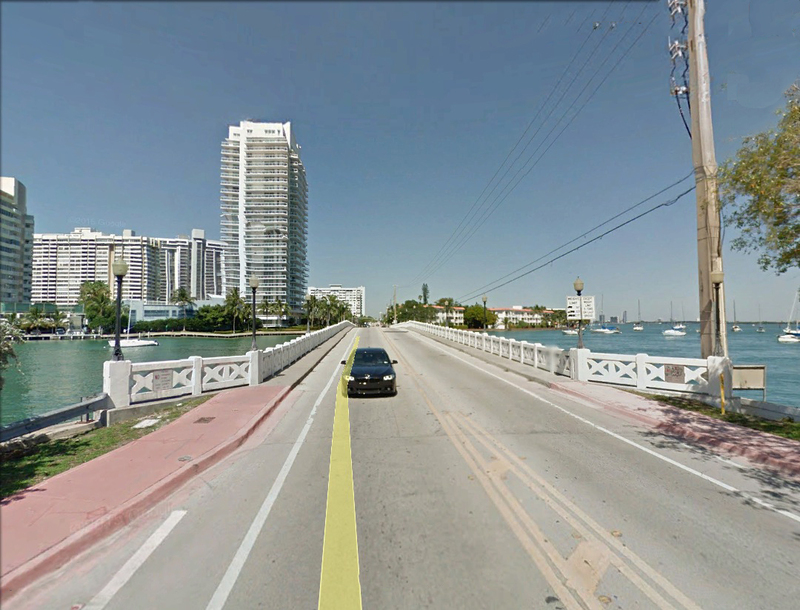 7.: Looking southwest along Biscayne Bay Path from 592 W Ave. towards a multi-tied Macarthur Causeway (2015). Fig. 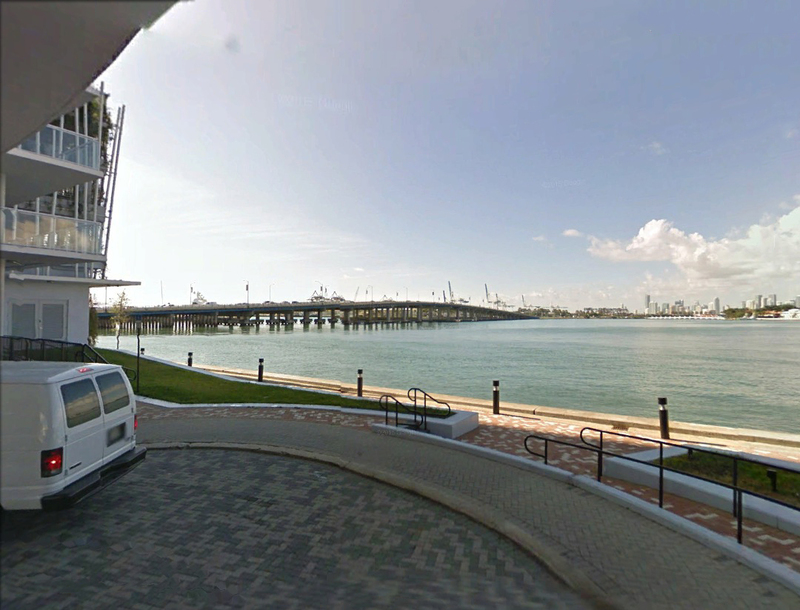 8.: Looking southwest along Biscayne Bay Path from 592 W Ave. towards a multi-tied Macarthur Causeway (proposed coastal adaptation). Fig. 9.: Looking west at 10th Ave. along seawall (2015). Fig. 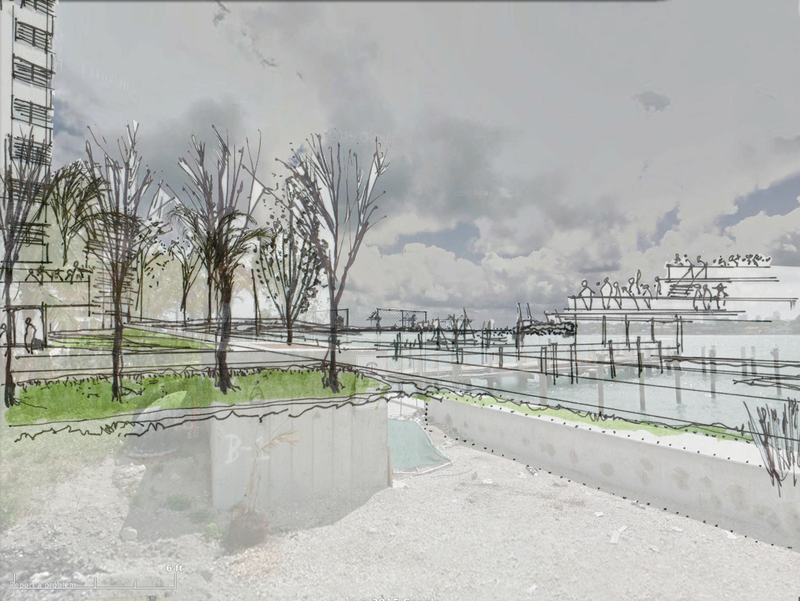 10.: Looking west at 10th Ave. (proposed coastal adaptation) along a raised Biscayne Bay Path. Fig. 12.: High Life on the ‘Low Line’: Light rail travels safely above, out of reach of rising waters, as the Venetian Causeway ‘returns’ to nature, giving pedestrians new access to the interface of land and sea.